Programmed to accommodate experimental teaching, the classrooms are clustered in pods each with common use areas, visitors classrooms, specialized labs and teachers support. 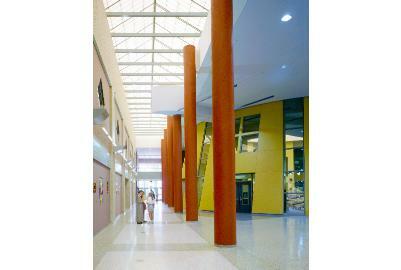 The common public functions of this 170,000 square feet complex for 1,200 students, define a major interior skylit plaza. Expressed as an object in the plaza is the heart of the school, the library. This form is penetrated by the teachers’ resource center connected to the administration. Materials, textures and colors express the individual character of the separate structures.